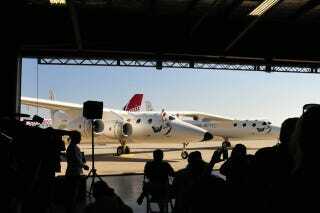 WhiteKnightTwo, which will shuttle SpaceShipTwo into suborbital space, is about to be unveiled in the Mojave desert. I believe that's SpaceShipTwo under the veil. Update: More Photos of WhiteKnightTwo below. Interview with a spaceship pilot. Actually it's a flight simulator for pilot training. Virgin America pilots will be trained to fly Virgin Galactic flights, which makes them the luckiest commercial pilots in the country. Before the ship rolls out, I might as well scribe a few of the details we learned earlier. • WhiteKnightTwo is completely carbon fiber composite, save for the engines and landing gear. • We were flown out from LAX on a new Virgin America plane called, "My other ride is a spaceship"
• Virgin American is 30% more fuel efficient than other domestic airlines. 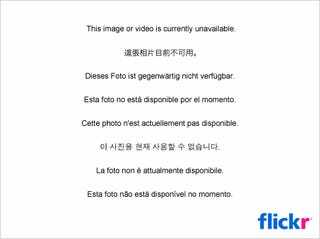 • Virgin America is giving away a ride on Virgin Galactic to one of its customers in a contest called "The Race for Space"
Bob Morgan, Lead engineer at Scaled Composites, is speaking now. He's said that the vehicle is triple the weight but has capacity for 12 more passengers. The plane's cabling system is also carbon fiber. • WhiteKnight and SpaceShipTwo can launch higher in altitude than the first ships, but the SpaceShip can't grab enough atmosphere any higher than the previous launch point, so can't go as high this way. So they drop the SpaceShip payload at the same altitude. • As far as bases go, after New Mexico, they'll open a spaceport in Sweden, and they're talking to Spain and the Far East. • Who can go on this? Because its suborbital, we can make the flight only 2-3Gs instead of 5Gs and so older people like Sir Richard's parents, Stephen Hawking and others are going to try going. • Food? Their solution is not feeding you at all. Probably for vomit concerns. • The wingspan has no seams, its one piece tip to tip. Composites don't bolt together well, so they don't use them. • This is about seeing the curvature and beauty of the earth and experience weightlessness. • 270 people are signed up and many have begun training in centrifuges to resist G forces. • The first ships will be called "Spirit of Steve Fosset" after Sir Richard's friend and his mother, "Eve"
• SpaceShipTwo is 60% done. • Will carry six Passengers and two pilots; could carry 11, but Sir Richard only wants to sell window seats. • Reclining seats to max cabin space in zero g and re-entry. • SpaceShipTwo can do 6Gs front to back, and 3.8Gs head to toe. • Zero G WILL be out of seat. I hope they have tethers. • WhiteKnightTwo can ferry SS2 coast to coast in the US. • Hugging the WhiteKnightTwo is emotionally satisfying, but the hull tastes dusty. • The port cabin is a mockup with painted windows.